The power line surges could be caused by lightning or not so dramatic and more common events like downed power lines, sudden changes in electricity use by a big time user from your neighborhood, or cycling on/off of air conditioner, electric dryer, laser printer, etc, in your home. The electrical power surges are a fact of life in Toronto, Mississauga, Etobicoke, Oakville, Brampton and GTA. They happen unexpectedly, last only for nanoseconds to microseconds, and could damage beyond repair any electrical or electronic device having a motherboard. The partial list of the electrical surge “victims” includes: furnace, A/C, fridge, computer, TV set, home theater, dimmers, GFCI plugs, bulbs including LED and CFL, electric car charger, etc. High-energy power surges can be suppressed at residential electrical service entrance with a Whole House Surge Protector. Typically, suppression of 10,000 Amp ( 10 k Amp ) is good enough for a basic protection. It is still possible, but rare, to impart 100 k Amp surge by a lighting strike. One of important Whole House Surge Protector parameters is Joule rating. The properly installed Whole House Surge Protector will absorb some of the surging energy ( measured in Joules ) and dissipate harmlessly over 80% of it into ground. Damage from direct lightning strikes via other paths ( TV or phone cable ) must be controlled separately. 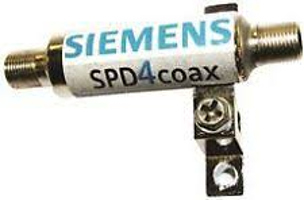 Samples of the other paths surge protectors are shown below. A Type 1 SPD would be installed at the service entry before your power meter. It protects the whole house. It is expensive and often not allowed by the power distributing company. 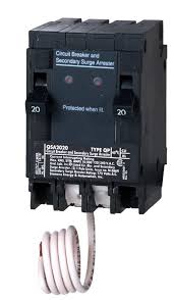 A Type 2 SPD, like the one shown above, should be installed at your Main Electrical Panel. 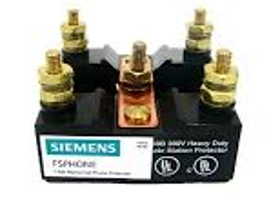 It protects all circuits and sub panels from external and internal power surges. The Green Electrician has experience in installing Type 2 Surge Protection Devices and can protect your whole house from electrical power surge. A Type 3 SPD is your last line of defense against electrical power surge. You can build this line of defense yourself. It consists of surge protected plugs or receptacles, and surge protected multi receptacle extension cords. 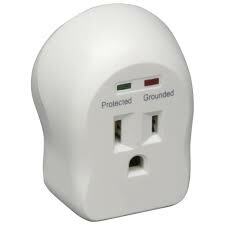 A Type 3 Surge Protection Device protects only the device plugged into a surge protected receptacle. Please make sure protectors you use do have a surge protection built in (as opposite to the overload protection breaker only).